My previous blog “greenhouse blues” describes how I overwintered plants for 2014-15 and 2015-16. 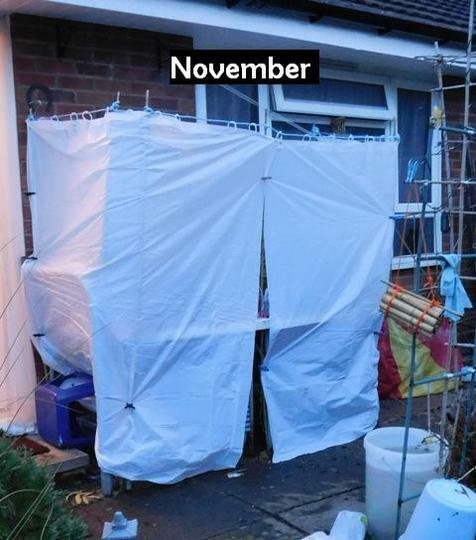 But I had to come up with a new “cunning plan” for last winter. Then I put some polyprop rope around the top. Then I draped the plastic over the rope, using clothes pegs to hold it in place. 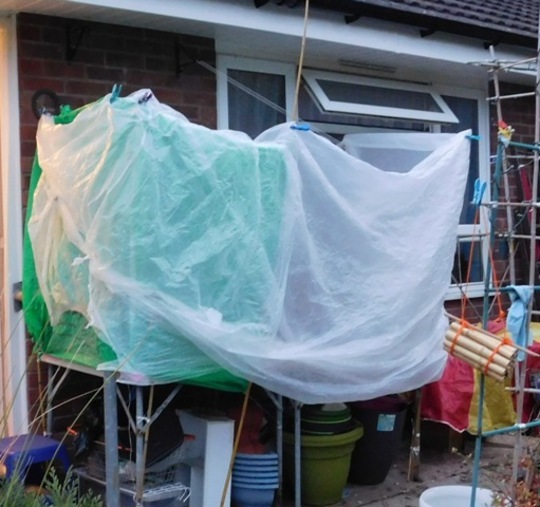 I couldn’t roof it; no way to support the back, and anyway if I did roof it the accumulated rain would sooner or later [probably sooner] have pulled the fastenings loose and the plants would have had a sudden freezing deluge. 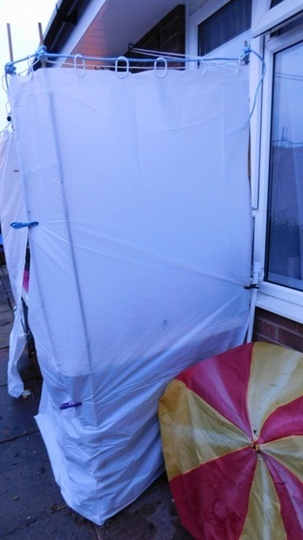 Anyway, I was more concerned about trying to keep the wind out, or at least diminish its impact. Not very elegant, but it held for about a week. The plastic kept tearing, and I kept trying to put the strips back and peg them into place. 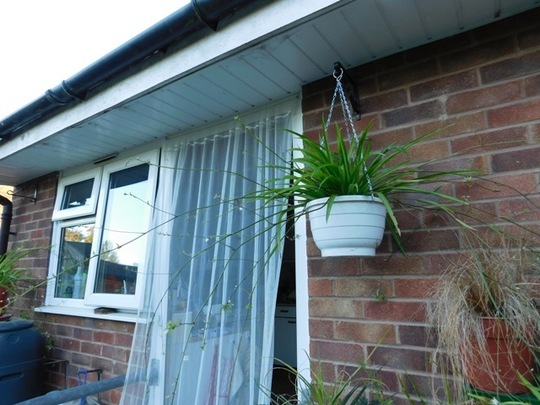 They wouldn’t quite go all the way round all the way up and down – I’d tied one bamboo to the handrail, so the curtain had to go outside that, otherwise I could have tucked it inside and saved a few precious inches for where it was needed more. This might be why my window-cleaner stopped coming round! This is the state of play in April: as you can see, the shower curtains didn’t survive intact, and I was using anything I could to patch to gaps – or at least, the worst of them. But the whole thing held together – more or less – for five months, from the last week of October to the first week of April – and that’s five months of winter wind, rain and storms. I’d open the curtains when it was sunny and not too windy, to give them a break, but I had to keep an eye on the weather so that I could batten down the hatches again as soon as the wind picked up. 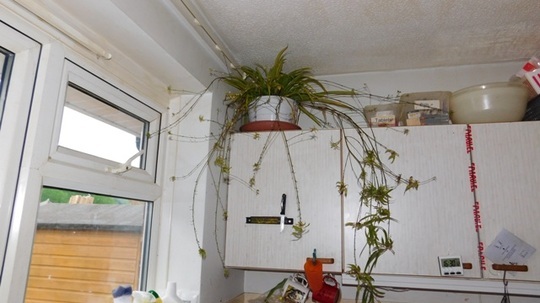 And more plants survived than died [small conifers excepted!] so at least it probably did some good. It was the best I could do, anyway. I do so admire your ingenuity and persistence Fran. I really enjoyed this blog. Well done on keeping all those plants through 'til spring. Fran you really make me laugh while having to admire your ingenuity and determination. I think your conifers would have been OK left outside, they are pretty tough as long as the containers don't freeze solid and the wind isn't freezing gale force. Fran would it be easier to cope if you mostly had plants that would survive in the ground? 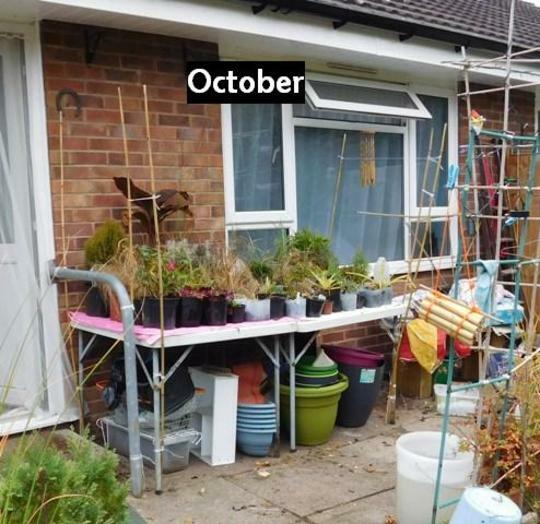 Oh Fran,you make me laugh,but well done,for getting your plants through the winter,I use pegs a lot and mine ping off all over the place. Thanks all. The curtains got in a mess towards the end, hence the patching, but they sort of worked. Forgot to mention that I put an old bath sheet on each table to stand the plants on, so that when it rained they'd have some moist surfce to draw on. Some of the conifers were dying even before I strated this; I put them in anyway, on the principle of it-can't-do-any-harm-anyway. We didn't get more than a dusting of snow, but that was what I was most worried about: cold outside, ok, but cold plonked right on top as well? 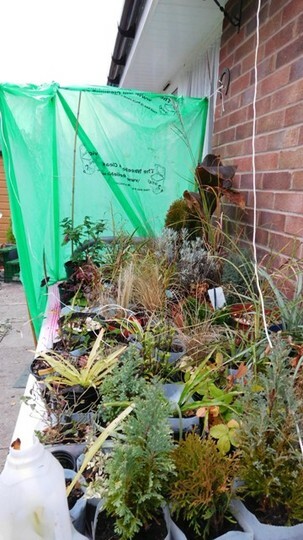 @ Steragram - I don't have many plants in the ground, mostly shrubs, and the plants that were there when I moved in. I still haven't worked out what kind of finished design I want, and didn't want to put a plant in, then take it out a while lter because I'd changed my plans. Not good for them to be disturbed too often, or even at all. I'm planning raised beds - easier for me to reach, as well as to appreciate the flowers - but what size, and where? I'm stiff faffing around trying to work that out. I've seen an idea on another site: put empty pots in the ground, thenplace ptted plants in them; then the plants cna be moved about without digging them up and disturbing the roots. Raised beds sounds a good idea Fran,but it is hard work,I have two now in my garden,and it does make life easier.Good luck with it and all the very best. I was thinking of off-the-ground ones, rather than raising-the-ground-level sort: they'd take an awful lot of filling, and the bottom half would be dead space, not needed by the plants - unless I grew trees, lol. But a built-up-from-the-ground raised bed apparently counts as a "permanant structure", which I'm not allowed. I've seen lots of wooden raised bed tables; some as holes with raised edges: fill with soil and plant, some as ladders to put platned troughs on. I'm thinking of a cross between both: putting troughs IN a raised frame, to help protect the sides from cold, and to stop them getting knocked off - ha, in both senses of the term! I just need to work out the size to fit two square tubs in side by side or two long troughs in tandem. And the height, of course. As they'd be fairly small they'd be easy to move, to get the positioning right, and I could move them about witout disturbing the contents too much. That sounds a brilliant plan Fran. Well, I'm thinking "portable" and "accessible" - given my back injury and my visual impairment, working on the ground isn't much fun - espcially as the garden slopes! I have to kneel half-uphill, and I feel oddly unbalanced. And, with lift-out tubs and troughs, i can vary the display without having to disturb the plants next to the ones I'm moving - or even the ones I'm moving. Some ingenious ideas here. Fran. They should have invited you to that Eden (?) project on TV. They could have done with your help. I don't watch TV, so I didn't know there'd been an Eden Project programme. But my ideas seem ot come from 'way over there somewhere, I'm sure I'd be no use in a planning meeting! Fran keeping your plants alive and protected was the plan and although it might have seemed like a lot of faffing about you got them through the winter, wish you lived nearby, I always keep the huge plastic covers that come wrapped around new mattresses,furniture and suchlike, (always come in handy somewhere) they would have been ideal for you. You're right, Lincslass: I should look at how many survived rather than how many didn't. lol I've got stacks of clear platic bags/sacks; maybe I could make individual cloches or mini-greenhouses for a few plants?? Hadn't thought of that before, thanks for the idea. re the HA: I can't even have a summerhouse, even if it's not fixed to the fences in the corner. The way I see it, there's only two ways I'm going to leave here: if i win the lottery, or when they carry me out in a box. In the first instance, I could afford to repair any "damage" done to the property,a nd in the second, I'll be in no position to care about it! Now I'm not sure if I am suggesting something appropriate here. 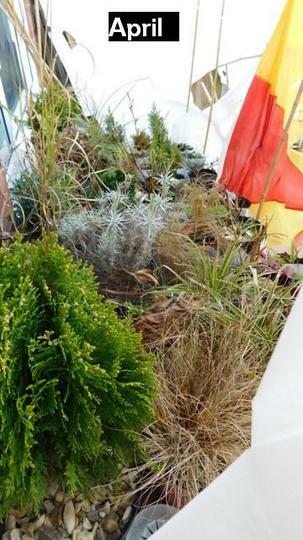 If there is a Freecycle site in your area why not ask for the side pieces used with gazebos? Many of these come with "windows" so your plants would have light. Not sure if the fabric would be too thick but it would certainly be protective. In strong winds gazebo frames can buckle and become useless. The side sections are always perfect. Well ours were/are. Bet others have had our problem. Come to think of it if you had a very sheltered spot you might even find a free gazebo to set up there. It's surprising what people give away. Or ask for cold frames. Worth a try. People are always throwing out stuff. There's a good Freecycle site locally, Eirlys [well, "local" - covers half North Wales as well!] and there have been greenuouses, sheds and even conservatories on offer: my main problems are a) they're all "you have to dismantle it", b) I'd have to get the bits home [I have no transport], and c) I'd have to reassemble them! 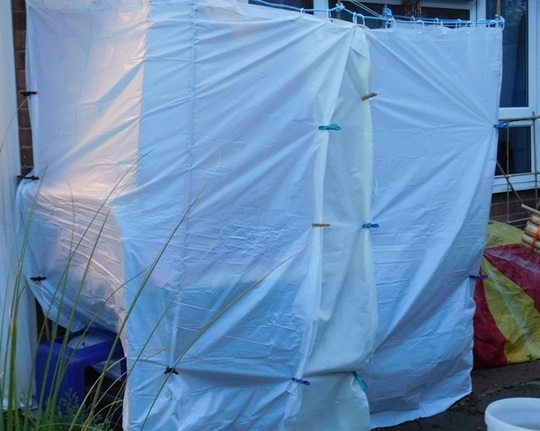 I've looked at plastic gazebo thingies, but they'rea ll too big; I never thought of getting just the side-walls. I'd suppose that if anyone had a gazebo to give away, they'd eant to give it all away in one piece, and the person taking it would want it all in one piece. But I could look at buying just the side walls. I've got a space between the sheds, which is fairly sheltered: it's 8x4, which is a prob cos sheds are 6x4 ot 8x6: I've been trying to think of ways to at least roof the space to give me a dry outdoor working area - at the moment, I work in one of the sheds, and when the sun's out, it's extremely hot and no air movement at all. But gazebo walls ... I'm going to go and get my hat so I can take it off to you! ps: just did a Google for "gazebo 4 ft" - if i can get 2 4x4, they'd fit the space. Google can find me 4-METRE gazebos, but apparenly it can't work in feet. So I put "4 ft" in quotes, meaning that it had to be included in any search, it's offer - all I'm being offered now are "pet gazebos", which are apparenlty pet cages with sunshade roofs. And Amazon ignores the "ft" and offers me more 4-metre ones. sigh. Maybe I should just try searching for "walls"